This method of Benjamin and Quinn uses a model of tiling a row of squares with stackable tiles and (non-stackable) dominoes. For example, in the diagram below, the first square may be tiled with 1-3 square tiles, or a domino may be placed on the first 2 squares. The second square may be tiled with 1-7 squares, or by using a domino on squares 0 & 1 or 1 & 2. ++++So, just tiling the first two squares, without dominoes there are ways of stacking squares; using a domino, there’s one way. There are 7 ways of tiling the second square alone – by using 1-7 tiles. So we have: ++++ . ++++• no dominoes. Then there are 3 ways of tiling the first square: with 1, 2 or 3 square tiles. So there will be ways of tiling without using dominoes. ++++• 2 dominoes. There’s only 1 way to do this. ++++• 1 domino. It could be placed on the first square, the 2nd or the 3rd. ++++++++a. If on the first, there are ways to tile the last two squares. ++++++++b. If on the 2nd, there are ways. ++++++++c. If on the 3rd, there are ways. So adding these: ways. This gets the numerator of the fraction. To obtain the denominator, we remove the first square, leaving 7, 15, 1. So the total is , and the continued fraction is . Nonregular continued fractions, i.e. 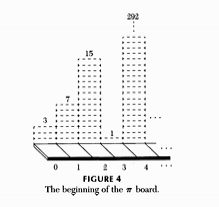 of the form can be represented by a similar model, by using stackable dominoes also. ++++• on the first 2 cells, a stack of 1 or 2. ways. ++++• the the second 2 cells, a stack of 1 to 4. ways. ++++• dominoes not used: ways. So the sought fraction is .